The hole, called a patent foramen ovale (or, more commonly, PFO), is an opening between the upper chambers of one’s heart. Some migraineurs who had PFOs closed for another reason reported that their migraine attacks stopped or were much less frequent after the surgery. The hole is present in fetuses to allow blood to pass from one side to the other. In most people, the gap closes at or after birth. For an estimated 25% of the US population, it doesn’t close completely and the PFO forms. This remaining tunnel functions as a valve. Normally the valve is shut, but sometimes remains open, sending blood that’s supposed to go to the lungs off to the brain and other parts of the body. This week’s Circulation (on-line version) released the much anticipated MIST trial (Migraine Intervention With STARFlex Technology) results which randomized 147 patients with a moderate to large PFOs between implantation of a STARFlex PFO closure device and a sham (or placebo) procedure. The study’s primary efficacy end point was migraine headache cessation during the analysis phase. It was derived from diary data. Secondary efficacy comparisons were incidence of migraine during the healing phase; change in the severity of migraine attacks based on MIDAS (over a 3-month retrospective period) and headache impact test (HIT-6) (over a 1-month retrospective period) scores; change in the frequency of migraine attacks other than elimination of attacks; change in the characteristics of migraine (with or without aura and change thereof); change in the severity, frequency, and character of migraine relative to effective closure rate or presence of residual leak; and change in quality of life based on the SF-36 questionnaire (over a 1-month retrospective period). Dr. Wes notes that Peter Wilmshurst, one of the original main lead researchers is not included in the manuscript. At a conference last year, Wilmshurst claimed study data were not managed correctly. Many PFO closure studies, like PREMIUM and ESCAPE are still happening. As is MIST-III, a longer-term trial with the same device as MIST-I. I’m not ready to dismiss PFO closure for migraine. This trial was a pretty big deal, but other study results are necessary. I guarantee I’m not letting anyone near my heart unless there’s strong evidence for doing so. 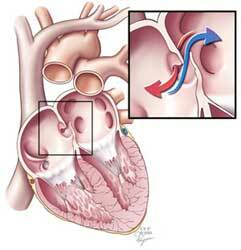 Graphic from Cleveland Clinic’s PFO page.